Perhaps you’ve noticed the milk aisle is looking a little more plant-based lately? Plant-based milk is big business these days – it seems like every week a new brand, flavor or type of plant-based milk appears on the shelf. 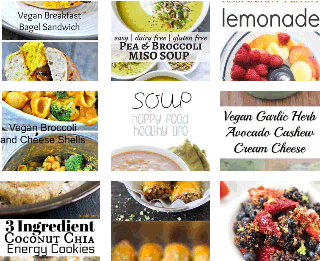 Once considered exotic fringe foods, almond, soy, and rice milk now seem almost old fashioned compared to the ever-expanding selection of vegan milk such as cashew, coconut, oat and even hazelnut, pecan, macadamia, walnut, hemp, quinoa, flax and pea protein milk. These newcomers are experiencing fast growth and who knows what new type of plant-based milk is coming next! In addition to the big boys like Silk, Pacifica, Blue Diamond and Califia and store brands such as Kroger’s Simple Truth, Whole Foods’ 365, and Trader Joe’s, we’re seeing an increasing selection of considerably more costly, harder-to-find “boutique” or “barista-style” brands such as Malk Organics, New Barn Organics, Ripple and Three Trees (also organic). It’s not just your imagination that the plant-based milk section of the store is expanding. Over the past five years, plant-based milk sales have gone up 61 percent. From 2017 to 2018 alone plant-based milk sales rose 9 percent to a whopping $1.6 billion. Plant milk has found its way into 33 percent of American households and has captured 13 percent of the milk market. 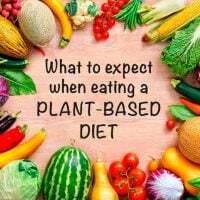 So, this should all be good news for plant-based eaters, right? Well, not so fast. Mass produced plant-based milk is not necessarily as healthful as you might think at first glance, and if you can’t afford those higher-quality boutique brands, homemade is definitely the way to go. 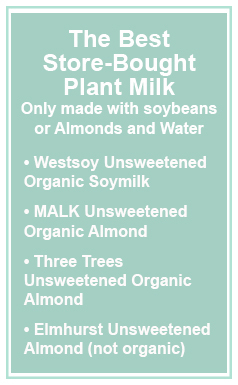 Many leading brands of plant-based milk such as Blue Diamond, Silk, Califia and Trader Joe’s are not organic. This is especially concerning when it comes to almond and soy milk. Starting in 2007, in response to salmonella outbreaks, all domestically-grown almonds – and no other nuts – have been required by law to be pasteurized. 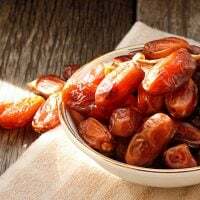 The two most common pasteurization processes are a steam process which is acceptable for organic almonds, or a chemical process involving propylene oxide (PPO), which is highly toxic and can only be used on conventional almonds. Pasteurization by steaming does not affect the nutritional profile or the taste and feel of the almonds. Blanching, dry roasting and oil roasting also count as pasteurization. Other non-chemical methods have been introduced more recently, including infra-red heat in 2012 and radio frequency waves in 2015. The problem is that when if you’re buying conventional almond milk you really have no way of knowing whether the almonds used to make the milk were pasteurized with PPO. It’s possible that some manufacturers may source only non-chemically treated almonds, but you’d have to do your research to see if that’s the case, and for which brands. According to the National Cancer Society’s 14th Report on Carcinogens, PPO is listed grouped under the “Reasonably Anticipated to be Human Carcinogens” category, the fourth and least concerning of their rankings, but still not great news, right? Keep in mind that PPO is used in numerous commercial materials including furniture, appliances, automotive and building insulation foams, as well as coatings, adhesives, sealants, resins, and fibers. Yum. Even if conventional almonds aren’t pasteurized with PPO, 85 percent of all domestic almonds are sprayed with Monsanto’s controversial Roundup (glyphosate) weedkiller. In July 2017 the state of California declared that glyphosate is known to cause cancer. In March 2019, the second of two juries likewise found glyphosate to be carcinogenic. Propylene oxide? Glyphosate? Nothing I’d want to be drinking. The moral of the story is, you’re going to use commercially-prepared almond milk, make sure you buy organic. When it comes to conventional soy beverages, you’re at serious risk of consuming Monsanto’s soybeans, which are genetically modified and like most conventional almonds, sprayed with Roundup (glyphosate). About 94 percent of conventional soybeans grown in the United States are GMO. If you’re going to go with store-bought, look for either organic soymilk or products verified non-GMO by the Non-GMO Project. Their certification symbol, which should be clearly visible on the package, has a light blue background with two green shoots and an orange butterfly. Or, better yet, make your own. You’re probably familiar with the phrase “nutrient dense,” which refers to foods that have high concentrations of things that are good for you, such as vitamins, minerals, antioxidants, protein, and essential fatty acids. Most commercially-prepared plant milk, with perhaps the exception of the higher-cost “boutique” brands that we’re starting to see in select shops, is the opposite – they’re nutrient poor. Most of the nutrition in these manufactured milk come from added, often synthetic, vitamins such as vitamin A palmitate, vitamin D2, riboflavin, and vitamin B12 and calcium in the form of calcium carbonate or tricalcium phosphate, for instance, all of which you may or may not want to be ingesting – but with store-bought plant milk, you have no choice. One cup of Blue Diamond Almond Breeze Original Unsweetened Almond Milk, for instance, has 2.5 grams of fat, 1 gram of fiber, and 1 gram of protein. It may only have 30 calories, but what are you getting from those calories? Why so little nutrition? 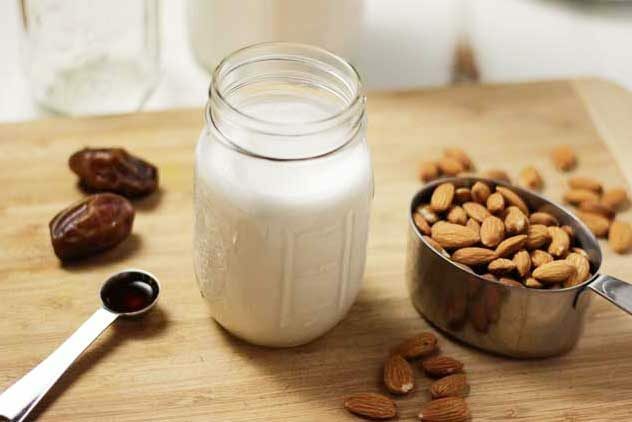 The sad but little-known truth is that a half-gallon of almond milk contains less than a handful of actual almonds, according to industry insiders. 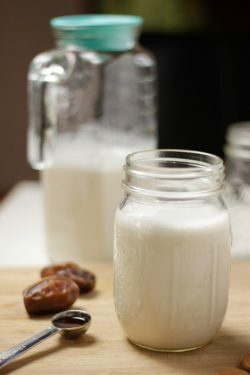 My fresh and tasty Homemade Almond Milk recipe calls for a whopping one cup of almonds per quart. 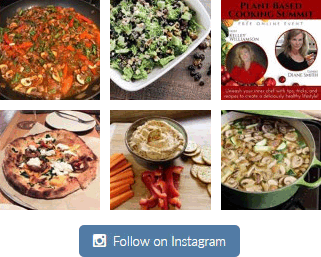 If you’re looking for nutrition, you know where to find it! More Sugar Than Ice Cream? Going back to our Blue Diamond almond milk, if we look at the regular version, not the unsweetened, we’ll find that it has six added grams of cane sugar, and 30 more calories for a total of 60 calories. Half of the calories in a serving are coming from added sugar! The same is true of Silk Original Almond Milk. The flavored varieties, such as chocolate, have even more added sugar. Blue Diamond chocolate almond milk, for instance, has 17 grams of added sugar. Yikes. That’s more sugar than some brands of ultra-premium ice cream! Carrageenan comes from seaweed and is a common ingredient in processed foods because of its gelling, thickening and stabilizing properties. It has no nutritional value and there are potential health concerns, although the jury is still out. Animal studies have shown that carrageenan causes intestinal problems, specifically epithelial cell loss, intestinal permeability, and diarrhea. But, as they say, when in doubt, do without. Gums such as xanthan, guar, locust bean, and gellan are used to thicken what would otherwise be a very watery beverage. Studies have shown that guar gum can lead to excessive gas and abdominal discomfort, while a study of gellan gum in rats found abnormalities in the intestinal microvilli. Locust bean gum studies have shown that it can lead to a temporary increase in gas. Xanthan gum can likewise cause digestive distress in sensitive individuals and in large doses has been shown to alter the gut microbiome, although it’s not clear if this alteration is problematic. With homemade nut, seed and grain milk you get naturally thick and rich beverages and don’t have to worry about gastric distress. Yet another reason to DIY. Commercial plant-based milk is processed foods. If you’re following a whole food plant-based diet, it’s really worth a little bit of extra time and effort to make your own homemade nut, seed, and grain milk. Drink up your cup of homemade health! 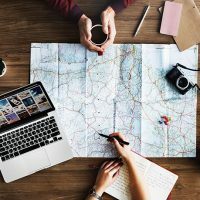 Thank you for a very tbought provoking article. It gave me a lot of food for thought. Not everything marketed as healthy is healthy! Thanks for your comment. I’m glad you found it helpful.